Multi-purpose packing crates for hire in London. Different types and sizes. Discover packing crate types, sizes and usage. Choose right crates for your needs. 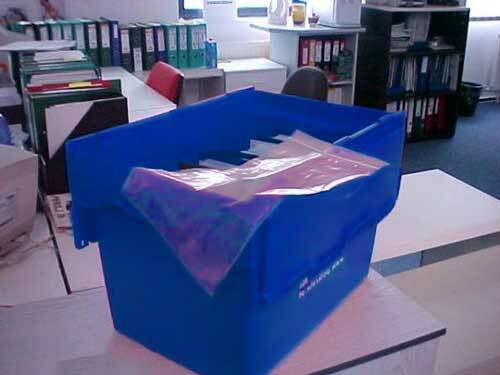 Hire plastic packing crates for moving files, stationery, computers and other office content. Relocating your office is a huge job and you should always pay some extra attention to it. While moving process, all your office assembly needs to be disassembled and packed for the new destination. Office means lots of important files and stationery along with lots of other items. During the relocation process, if one item is lost that is going to be the darkest nightmare to you. The safest and the quickest way to move your stationery, archives, loose items from desks and the contents of pedestals and storage cupboards is using office moving crates. We have 5 different crate types available for rent. Each crate has been carefully designed to hold particular items. Our plastic packing moving crate hire company in London is always happy to advice you on what type of removal crates you should hire to meet all your requirements. Office move crates are plastic boxes designed exclusively for particular usage. There are several types of packing crates available in the market. But before moving on with them, you need to know their variation is shape and size and usage of each model. Our removals London company will be happy to help you with choosing the right crates. By knowing their particular shape, size and usage you will able to hire right crates and use them with maximum efficiency. If you know each and every type of packing crates, you will be able to choose the right one for your needs. Hiring packing crates does not have to be expensive. For repeat clients or large quantities crate rental we have special offers, attractive discounts structure or a free crate delivery and collection services. For more details or hiring plastic moving containers in London please contact our office. Our customer service employees will be happy to answer all your questions, prepare the quote with broken down crate hire rates and additional services prices. We will advice you on the usage of the particular containers and the daily, weekly or monthly crate hire costs. Hire moving crates at affordable prices and get outstanding services associated with crate rental. Contact our moving crate hire companies London today! Small Crates are small in size. Their dimensions are – Height – 10 inches, Length – 16 inches and Breadth – 10 inches. This type of moving crate is good for packing small items that are heavy. The common items that are packed in this kind of plastic removal crates with lids are – books, records, files, CDs and DVDs, small devices, tools, etc. There are larger sizes of this crate also available for packing larger items. Hire small moving crates at cheap prices! Medium Crates are medium sized crates. Their commonly used dimensions are Height – 12 inches, Length – 18 inches, Breadth – 14 inches. This medium sized office move crates are ideal for transporting most of the medium sized items in your office, such as – paper packets, printers, large files, appliances, etc. You can pack in anything else if you wish to. But keep one thing in mind do not keep it empty. Always make the most use of moving crates; this will reduce the moving cost. They are perfect for moving the contents of pedestals, items from the desks and stationery. Once can use them to move office files too. Large plastic packing crates crates are large. Large Moving Crates have dimensions of Height – 15 inches, Length – 15 inches, Breadth – 15 inches. Large Crates are great for packing large items, such as – colour laser printers, large size ink-jet printers, office supplies, computers and desktop servers. Pack large items of your office in these large crates to ensure that they are packed with optimum protection. Large Plastic packing Crates for Rent London can be delivered to at any time with just a couple of hours notice. 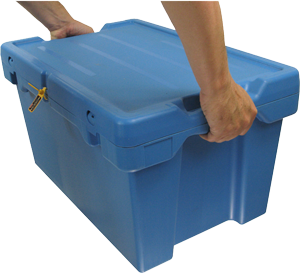 Call us now, tell us how many plastic moving containers with lids you want to hire and we deliver them to you ASAP. 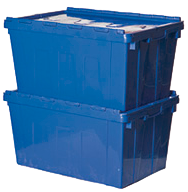 These crates are perfect for a long term on site storage of confidential documents. Plastic packing containers hired from our London Cheap crates for rent companies can be stack up. Because the crates have lids piling them will not cause any damage to their content. Large moving crates are ideal for moving a warehouse. They are perfect for packing all loose stock. Why hire and use office packing crates? Plastic is one of the most versatile items used now a day for different proposes. Plastic has changed the way of transportation, storage and display. Prior plastic era cardboard boxes and wooden boxes were used to move different smaller and large items. There are lots of limitations and drawbacks of using cardboard boxes and wooden crates – they are heavy; they are not that much durable and moreover they are not waterproof. That is a way hiring cardboard boxes and wooden containers are not used in transportation in recent times. Plastic relocation crates have taken the place of cardboard boxes and wooden boxes. There are more than benefits you can have by renting out and using plastic crates instead of something else. Plastic packing crates are durable; they have more self-life than classic wooden boxes or cardboard cartons. More durability means you will be able to use the crates for a longer time; so you are making a wise decision by purchasing plastic moving crates. So it is cost effective in term of usage duration. Hired Plastic Crates are easy to transport – they come with attached lids, you can cover the lids without any extra efforts. They have attached handles – handles make it easier to carry them. Moreover, being made of plastic these office files and office content removal crates are light weight, so you can easily handle on yourself when they are empty. And as they are easy to move they help us saving a lot of fuels. As all of us knows, plastic is anti corrosive, and it is known to react with only a few chemicals. So you can easily pack all your assemblies into plastic moving crates without the worry of corrosion. As plastic is waterproof it is good for you to clean them if they get wet or damped. Even if a cheap plastic crate for hire gets dirty, you can clean it with a wet cloth or use detergent to clean it. In terms of cleaning it makes a huge difference from other packing boxes, wooden boxes and cardboard boxes can never be cleaned with such ease and they are not full water resistant also. Our packing crates for hire in London are odourless, while transportation of different types of goods creates tend to retain dust and other contaminants, but it stays clean and odour free for a long period. 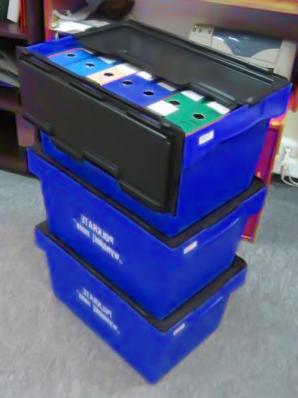 Plastic office crates are one of the best ways to transport all kinds of office files, stationery and personal belongings of your employees including Information Technology equipment likewise computer and server removals.